In Brief: There aren't many souvenirs recognizing the late Alex Karras's time in pro wrestling, but fans can pick from dozens of football cards of the legendary athlete and actor. Depending on your age, you probably best remember Alex Karras as either one of the fiercest defensive football players of his time, or as the lovable George Papadapolis on the TV show “Webster.” But, Karras, who passed away on Oct. 10 from complications related to dementia and kidney failure, also enjoyed a brief career in professional wrestling. Big money contracts would prevent stars of today like Ray Lewis and Troy Polamalu from ever wrestling a match, but athletes during Karras’s era often supplemented their incoming by wrestling during the offseason. There aren’t a lot of mementos from Karras’s time in wrestling. Occasionally, press photos or programs from wrestling events in the 1950s and 1960s surface for sale on eBay, usually selling in the $10-15 range. Karras has appeared in several football sets over the years. His rookie card was included in the 1959 Topps set. Finding a copy of that card isn’t difficult, but most aren’t in great shape. A raw, ungraded copy with slightly rough corners and surface scratches usually sells for about $25, with cards graded by Professional Sports Authenticators (PSA) or Beckett Grading Services (BGS) selling considerably higher. A PSA 8 (near mint to mint) copy of the card recently sold for $83. To date, 479 Karras 1959 Topps rookie cards have been graded by PSA. Of those, only two have received a PSA 10 grade, meaning those cards were in gem mint condition. About one-third (169) of all of those graded cards received a PSA 8 grade, while only 19 were graded PSA 9. 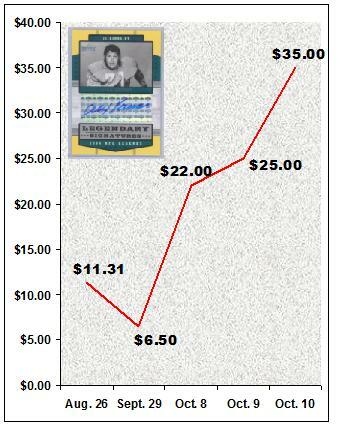 Several card companies have included Karras’s signature in products over the last decade. Collector interest has picked up significantly in Karras’s cards since news broke earlier this week that Karras was in his last days. Karras’s most commonly traded autograph is from the 2004 Upper Deck Legends set. On Aug. 11, one of these cards sold for $11.31. Prices jumped over the last week, with one selling for $22 on Oct. 8 and another selling for $25 on Oct. 9. Shortly after Karras’ passing on Oct. 10, one of these cards sold for $35. Karras’s death illustrates a morbid trend that has been described many times in this column. When an athlete or celebrity dies, sellers capitalize on collectors’s emotions by selling more items or raising the price of existing items. While Karras’s time in wrestling took place long before many readers of this column were even born, he was a beloved, larger than life figure. Fans who are looking to add a Karras card or other item to their collections should have no problem finding one. Pro Wrestling Torch Collectibles Specialist Michael Moore can be reached at michaelmoorewriter@gmail.com .